Liquor License NYC | Westchester Liquor License Attorney | Bruno V. Gioffre Jr.
Operating an establishment licensed in New York State to serve beer, wine, liquor and alcohol is highly regulated. There are many things that can occur which can put you in violation of your NY State liquor license and potentially shut you down. Allegations of violations of your liquor license occur in different ways and are serious matters. Violations occur through SLA on-site inspections, police and other government agency complaints, undercover investigations by the State Liquor Authority and/or law enforcement, and through civilian complaints. Moreover, violations often result in 2 separate actions that need to be defended: a criminal case in the local court and a referral to the violations unit of the NYS Liquor Authority. While the criminal court has no authority to revoke or suspend your liquor license, often a finding of guilty is dispositive as to the administrative allegations. 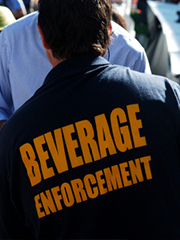 If you or your establishment has been either arrested for a NYS ABC violation, or violation summons only have been issued to you by the NY State Liquor Authority, you need attorney Bruno Gioffre representing you in both actions. In addition to practicing before the NYS ABC SLA violation’s tribunal, Bruno Gioffre is a skilled criminal defense litigator, having defended hundreds of people against misdemeanor and felony charges in both state and federal court. Further, attorney Gioffre has experience seeking relief through an Article 78 proceeding in Supreme Court when the State Liquor Authority over steps its authority in punishing a holder of a liquor license. Often times a formal violation is not issued, but serious issues arise upon the renewal of a liquor license that need to be addressed. This happened recently to the nightclub Imperial, a club located in the Chelsea section of Manhattan. Amid allegations of fighting, noise complaints, filth, intimidation, and rowdy behavior, the local community board requested of the State Liquor Authority that the club’s liquor license not be renewed. In a triangular negotiation with the community board and SLA, attorney Gioffre convinced the NY State Liquor Authority to renew club Imperial’s liquor license with certain agreed upon additional stipulations such as the club hiring more security, outdoor smoking areas for club patrons, and club management routinely meeting with the local community board. When issued a violation from the Liquor Authority the licensee is entitled to a hearing before an administrative law judge. This is a formal hearing, where testimony is taken and other evidence is levied against the establishment. The licensee is entitled to cross examine any witnesses against them, and the licensee is entitled to present their own evidence, witnesses, etc. At the close of the hearing the SLA ALJ renders a decision. However, this decision is only a recommendation to the NY State Liquor Authorities 3 member board that rules in a “majority rules” fashion. Prior to the Board rendering their judgment the licensee is advised of the ALJ finding and recommendation. If the licensee disagrees with the findings or if new evidence comes to light since the hearing, the licensee ma draft a Letter of Contraversion to the board for it to consider when rendering its decision. There is also another way to handle a violation. Under the rules, a licensee can plead “conditional no contest” rather than “not guilty.” With a plea of a conditional no contest, the licensee must recommend a penalty to the board. If the board accepts the plea and approves the proposed penalty the case is over. If the board rejects the penalty the case is set down for a hearing. call us at once for a no cost, no obligation phone consultation.